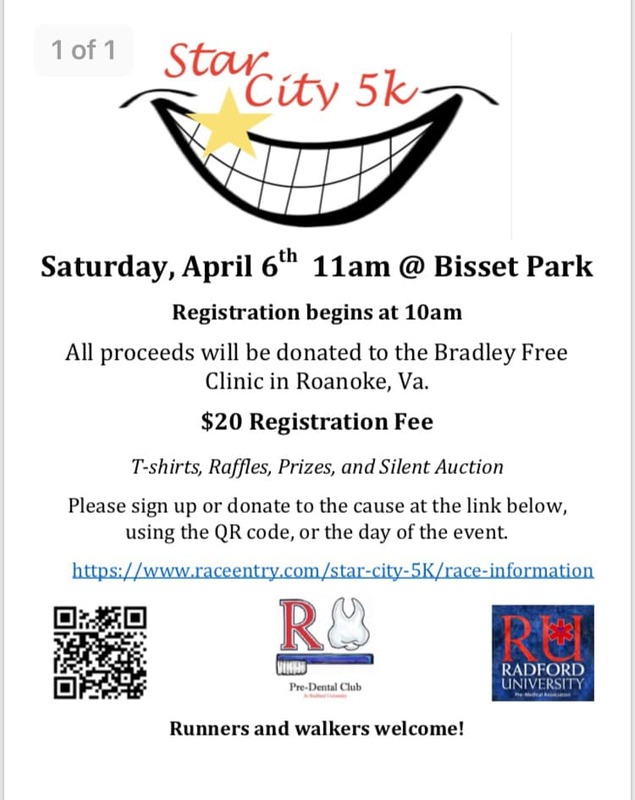 The Radford University Pre-Dental Club presents the 6th Annual Star City 5k on Saturday, April 6, 2019 at Bisset Park. The Star City 5K is a race put on by the Radford University Pre-Dental Club along with assistance from the Radford University Pre-Medical Association. All proceeds will be donated to The Bradley Free Clinic in Roanoke, VA where they provide free dental care and medical care to people in need. The cost is $20.00 per person and children under the age of 6 can run for free. To register online, visit: https://www.raceentry.com/race-reviews/star-city-5K. There will be t-shirts, raffles, prizes and a silent auction. Both runners and walkers are welcome. The check in table is at Pavilion 1 in Bisset Park. To view the event flyer, visit: https://i.imgur.com/OU25WXz.jpg. For more information, visit: https://www.raceentry.com/race-reviews/star-city-5K or https://www.facebook.com/starcity5k/.